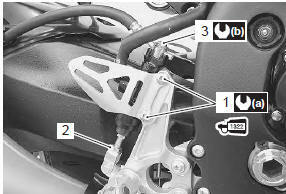 Refer to “rear brake hose routing diagram” (page 4a- 2). Remove the right side frame cover. Refer to “exterior parts removal and installation” in section 9d . Remove the rear brake fluid reservoir mounting bolt (1). Drain brake fluid. Refer to “brake fluid replacement” . 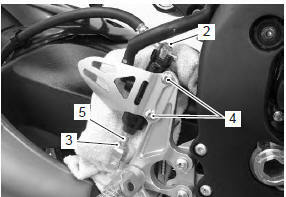 Place a rag underneath the brake hose union bolt (2) on the master cylinder to catch any spilt brake fluid. Remove the brake hose union bolt (2). Remove the master cylinder mounting bolts (4). Remove the master cylinder along with the reservoir by turning the push rod (5). 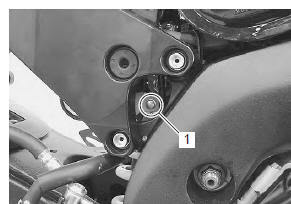 Apply thread lock to the master cylinder mounting bolts (1) and tighten them to the specified torque. Tighten the lock-nut (2) temporarily. After setting the brake hose union to the stopper, tighten the union bolt (3) to the specified torque. Bleed air from the brake system after reassembling the master cylinder. Refer to “air bleeding from brake fluid circuit” . Adjust the brake pedal height. Refer to “brake pedal height inspection and adjustment” .